For a truly memorable experience, soar high above the gorgeous landscape taking in the spectacular scenery. Enjoy a bird’s eye view of the Georgian Triangle, and top it off with a cozy dinner at a local favourite restaurant. Circle the Escarpment, fly along the Collingwood coast, and enjoy a wide selection of menu options ranging from comfort food to sirloin steak to complete the experience. ✔ Prices start at $200 and can accommodate up to 3 passengers. *$200 package includes a 30 minute flight experience for up to three passengers fully paid including all taxes and fees, plus a gift certificate for $50 to the Dornoch Tap and Grill redeemable towards any menu item. Upgrade to the full hour experience for an additional $150, taxes included, and explore the Beaver Valley with stunning views of Lake Eugenia, Eugenia Falls, old baldy, and the many quaint villages. The full hour tour includes some spectacular views of the Georgian Bay shoreline from Thornbury to Collingwood. Your aircraft for all packages is a new, safe, and reliable Diamond DA40 with stunning panoramic visibility out of the bubble canopy. Went up for a scenic flight to see the fall colours! Thanks, Johnny, for a great flight. We will be back. Purchase online or at the airport. Click here for directions to the airport. Add $2.99 handling fee for online orders. Online orders are mailed the next day. Flight and meal certificates are presented in a nice envelope and make a great gift. 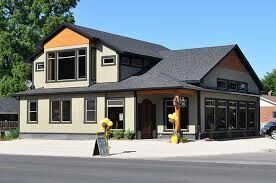 The Dornoch Tap and Grill is a local favorite that prides itself on great service and wonderful food. They serve burgers, pasta, pizza, steak, and more. Enjoy a bird’s eye view of the country’s most brilliant fall foliage.